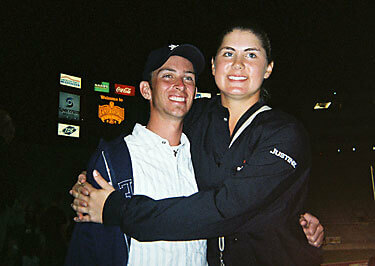 Justine Williams, a mellophone player with the Boston Crusaders in 2006, sent this picture. This is a picture of my boyfriend, Kyle Trader, and me at the DCI World Championship Finals in Madison, Wis., this year. We marched together at the Troopers in 2005 and have been together since. This summer he marched with the Blue Stars, while I marched with the Boston Crusaders. We didn't get to see each other at shows a whole lot this summer, but we were finally reunited in August! This summer Kyle plans to be back with the Troopers and I plan to be with Boston.